Elephant Room Gallery is excited to present their first Blues inspired art exhibition to bring in the New Year. The exhibition features artwork by 8 Chicagoland area artists that is inspired by Blues music and musicians of the past and present. 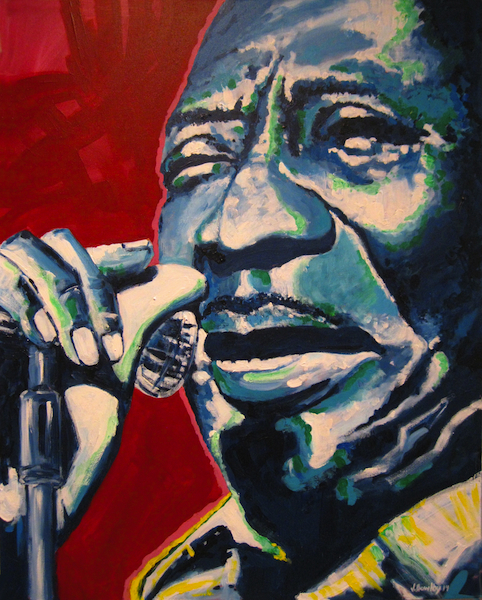 The exhibition features a dynamic collection of work from paintings of Muddy Waters, and Howlin’ Wolf to abstract guitar sculptures to portraits of the patrons in a Blues club. Exhibiting artists include Erik Lundquist, Nicholas Barron, Anitra Frazier, Joseph Bowlby, Nina Menduni, Tamara Wasserman, Vernell Garrett and Victoria Fuller. The exhibition runs January 5th through January 28th with open hours on Thursdays 1pm to 6pm and Saturdays 11am to 5pm. A reception will be held on Saturday, January 14th from 6pm to 9pm where guests will be able to meet some of the exhibiting artists.